Recently, an old roommate of mine asked me to send her my “recipe”. And since a few other folks have asked me for it over the years, this is the easiest way to throw it out there. It’s been about 13 years since my roommate has tasted it, so I hope it lives up to her memory. I’m afraid this is going to be like one of those recipes that my mom used to give to me that used to drive me nuts. It’s more like a process than a recipe. Remember that traditionally, fried rice is a way to get rid of leftovers, and you’ll understand the high degree of variability in the below. Note: Everything is cooked in the same pan – ideally a wok – but not all at the same time. You’ll need one large bowl to serve as your holding container as things are cooked and taken out of the pan. Just lump them all together after they’re cooked – no need to separate. It’s important to use day-old fried rice, not fresh rice. I believe this has something to do with oil absorption – fresh rice will absorb more oil than day-old rice. And your consistency will be wrong – too mushy. Day-old rice has a little more bite to it. 1/2 to one medium onion. Depends on how much rice you have. I like more rather than less, so I typically throw in a full one. Minced. Some kind of vegetables. Peas are easy. Leftover stir fry veggies are perfect. I’ve also used leftover edamame from sushi night and leftover veggies from a Thai rice noodle dish. Whatever you’ve got and whatever your family is willing to eat. Some kind of meat. Leftover meat works. I usually use either chinese sausage (that was cooked in the rice cooker with the rice the night before) or steak. Directions for both included haphazardly below. Beat the eggs and salt and pepper them. Fry in a little bit of oil in a wok. Pretend like you’re making an omelet. Let the eggs sit for a while in the pan before you start moving them around. Then try to flip them. But it’s actually pretty hard to make an omelet in a wok. So you’ll end up with something that’s half omelet, half scrambled eggs. Whatever. It’s all good. Toward the end, when the eggs have set, start using your spatula to break up the eggs into smaller pieces. Remove to a bowl and set aside. Melt a little butter into the pan. (olive oil works too, but butter is tastier). Once hot, throw in your minced onions. Shake garlic powder, salt and pepper on them. Saute until onions are cooked/translucent. I often season them once more as soon as they get translucent, then saute them for about a minute more before I take them off. Remove onions to bowl with the eggs. Set aside. Now take all that leftover veggie and throw it in. You’re really just warming them up. Once warm, add to egg/onion bowl. You can, of course, cook new veggies for this too. If you do that, I wouldn’t season it too much – salt, pepper, maybe onion or garlic or even a little ginger, but that’s probably unnecessary. Remember to cut all your veggies small – bite-size or even smaller if you have kids. After all, it would be weird to have to cut your fried rice. Remove and add to egg/onion bowl. Here comes the meat part. My ex-husband loves the steak version; my daughter can’t get enough of Chinese sausage (lap xeung), so it’s all a matter of preference. The steak version distinctly flavors the rice as well, though there’s a significant difference between the two in terms of taste. For Lap Xeung version: Typically, I cook the lap xeung the day before by throwing it into the rice cooker with the rice the night before. Usually, to make it easier, I also slice them that night – once lengthwise then on a bias, probably about an 1/8 of an inch thick. Keep it a container so it’s ready to go the next day. Fast forward to next day – throw cooked lap xeung into pan. Saute. You shouldn’t need to add any oil here – there’s enough fat in the sausage already, and you probably still have a sheen from the onions. You’re mostly just warming the sausage up, but the sausage also tastes super good if you get a little crisp on them – not too much, just a teeny bit of char. Once warm, add to veggie/onion/egg bowl. Incidentally, I would use essentially this process for any leftover meat as well (rotisserie chicken, perhaps?). For Steak version: Cut the meat into 1/2-3/4 inch cubes. Salt, pepper and garlic powder them. Put about a tablespoon of olive oil or butter in the pan, heat to medium-high. Once hot, add steak and cook until medium-rare. I have no idea how long this is. I’m sure it’s a few minutes. Couldn’t tell you how long. But since the pieces are pretty small and uniform, it’s not that long. I know. I’m full of useful information. Remove steak and add to onion/egg bowl. Do NOT remove accumulated juices. You’re going to add your rice to this. Take a fork to your leftover fried rice. What I mean by that is just jab the rice with your fork and twist. Do this a few different places. It makes it easier to cook. Now – if you cooked steak, then just toss the rice in there. If you cooked lap xeung or leftovers, you probably need to put a tablespoon or so of oil in the pan and let it heat up. Add the rice. Use your spatula to break up any remaining big chunks – and there will be many of them. This is kind of a pain, but important to do at this juncture. Once the rice is more or less uniform, salt and pepper the rice. I focus more on the pepper here than the salt – you likely have plenty of salt already, and you’re going to get more from the soy sauce. Continue to saute until seasoning appears uniformly distributed, breaking up any remaining medium or big clumps. Add soy sauce and sesame oil. I’m really sorry about this. I have no idea how much I add. I would say that I add about 3-4 passes of each. i.e. I take the bottle and I swing it over the rice in a back and forth motion. Use about half as much sesame oil than soy sauce. Mix the rice together until the color is uniform. Taste and adjust. Eventually, you’ll figure out what the right combination is for your tastes. Once you’re happy with the rice, dump your everything bowl back into the rice and mix. Once incorporated, I often just let it sit on a medium/medium-low burner for a few minutes, giving it just the occasional stir. You want to give those flavors time to meld together. And that’s it. Not very precise, I’m afraid – my rice is rarely exactly the same twice – but that’s the general process. Good luck! 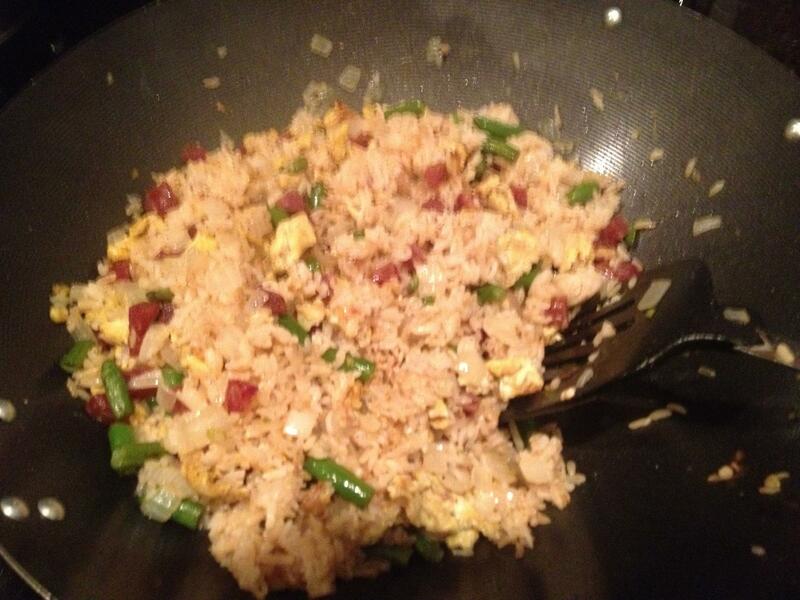 This entry was posted in General and tagged cooking, Food, Fried rice, recipes. Bookmark the permalink.